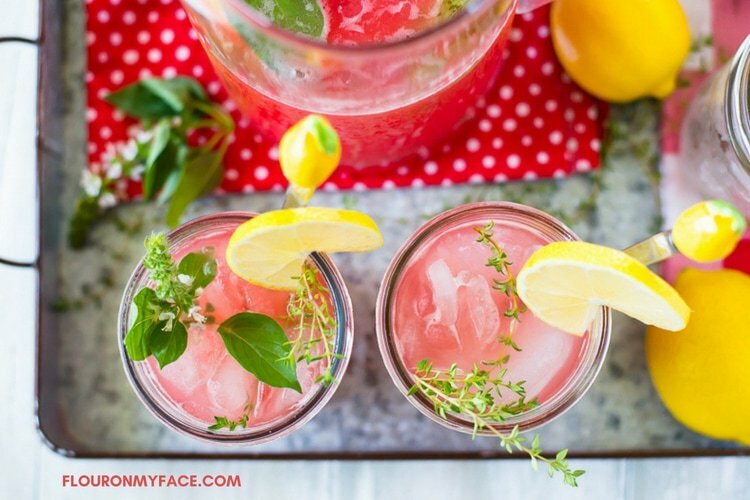 A Watermelon Thyme Lemonade recipe is just what you need for those upcoming warm weather gatherings. Memorial Day is almost here. Are you celebrating with a family barbecue? Planning a day at the beach or park and craving a sweet and refreshing glass of lemonade? Making a pitcher of homemade lemonade with freshly squeezed lemons is one of the best and refreshing summertime drinks to sip on during a hot day. If you want to make a fruit flavored lemonade recipe you will never go wrong making Watermelon Lemonade to serve the family at a barbecue. 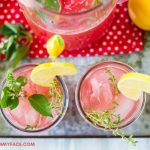 But if you really want to step up your summer lemonade recipe game make a unique flavored lemonade recipe like this Watermelon Thyme Lemonade recipe to impress your family and guests. In a large container combine the lemon juice, watermelon juice, water, sugar and thyme simple syrup. Stir to combine until the granulated sugar has dissolved. Fill a tall glass serving pitcher full of ice. Pour the Watermelon Thyme Lemonade concentrate into the pitcher until it is full. Stir well. Add lemon slices and sprigs of fresh thyme and basil (if desired) and stir once again. 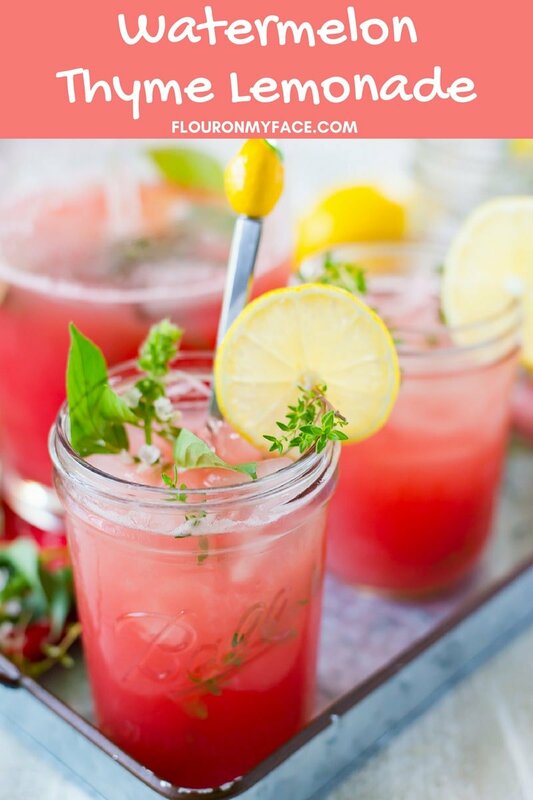 Serve the Watermelon Thyme Lemonade in mason jars or tall glasses that have been filled with ice and garnished with more lemon slices and fresh herb sprigs. 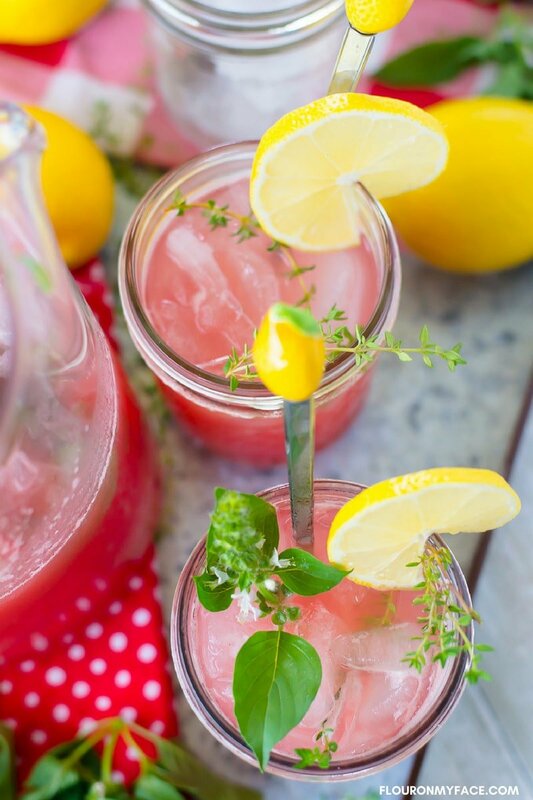 Replenish the glass serving pitcher with the remaining Watermelon Thyme Lemonade concentrate as needed. Make 8 to 10 servings depending on the size of glasses used to serve. Herbal Simple Syrups are so easy to make and can really add a lovely herbal flavor to many summer beverages. If you are growing your own herbs making an herbal simple syrup is another way you can use up all those fresh herbs that you are growing. Place the sugar and water in a saucepan. Mix until sugar is mostly dissolved. Place the saucepan on a burner over medium heat. Heat until just boiling. Remove the saucepan from the heat and allow to cool about 15 minutes. Syrup should still be warm. Slightly crush the thyme leaves and stems, cutting large stems if needed. Add the fresh thyme to the pot and push down under the syrup. Place a tight-fitting lid on the pot and allow to steep for a couple of hours or overnight. Strain thyme simple syrup through a strainer lined with cheesecloth or a coffee filter to remove all plant material. Place the thyme simple syrup in a container with a tight-fitting lid. Thyme simple syrup will keep for about 2 to 3 weeks in the refrigerator. Makes 1 cup thyme simple syrup. Freshly squeezed lemon juice is the best for lemonade but you could use bottled lemon juice if needed. Or a can of frozen lemonade concentrate. You can make any herbal flavored lemonade you’d like by making a simple syrup out of any fresh herb you have. Sweet Basil, Lemon Thyme, Lavender or Sweet Mint would also work. Want to learn how to grow your own fresh herbs for herbal lemonades and herbal cocktails? Check out my How To Grow a Cocktail Herb Garden for all my tips on growing backyard herbs. Buy my Backyard Herb Gardening eBook for more information on growing fresh herbs in your backyard. Homemade Watermelon Thyme Lemonade recipe using freshly squeezed lemons, fresh watermelon juice, and thyme simple syrup is a unique fruit-infused lemonade recipe that will impress your guests. Other Flour On My Face recipes using herbal simple syrup. I am so intrigued by the thyme! 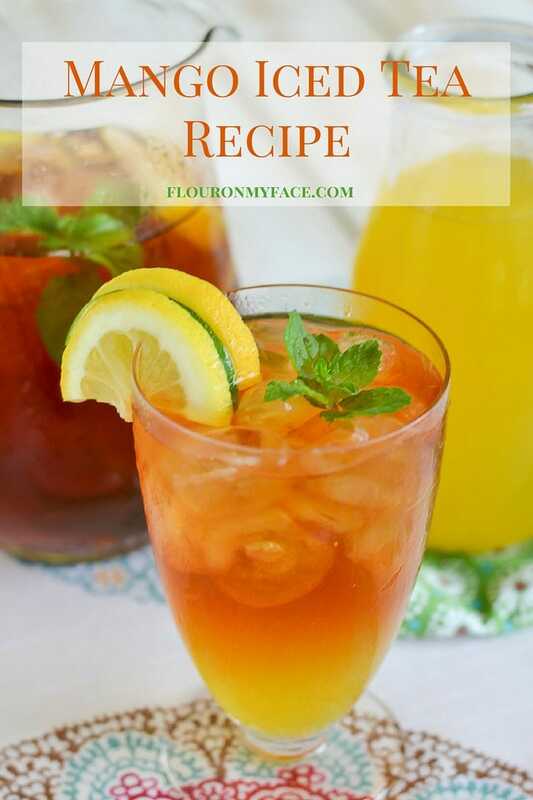 Pinning so I can try this recipe this summer. 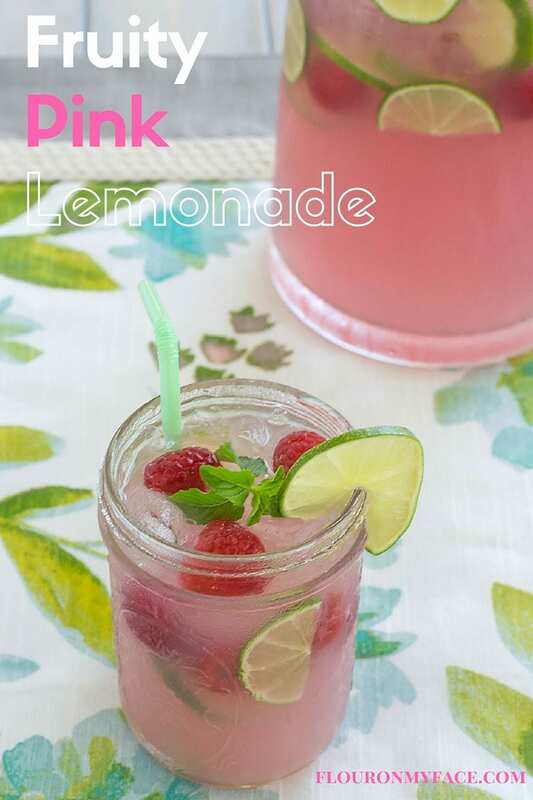 Thanks for linking up with Merry Monday – I’ll be featuring your lemonade at our upcoming party. We’d love to see you again next week! Thyme is such a versatile herb. I love it.